Risotto is one of my favourite dishes, especially in winter. I actually find the process of cooking a risotto (the repetitive action of adding the stock and stirring) quite relaxing, almost meditative. However, because Jerome doesn’t like risotto, I rarely cook it at home anymore and I usually only get to eat it at restaurants. I was looking for a recipe to cook at a friend’s house this week for a cooking/DVD night when I found this recipe for mushroom quinotto. 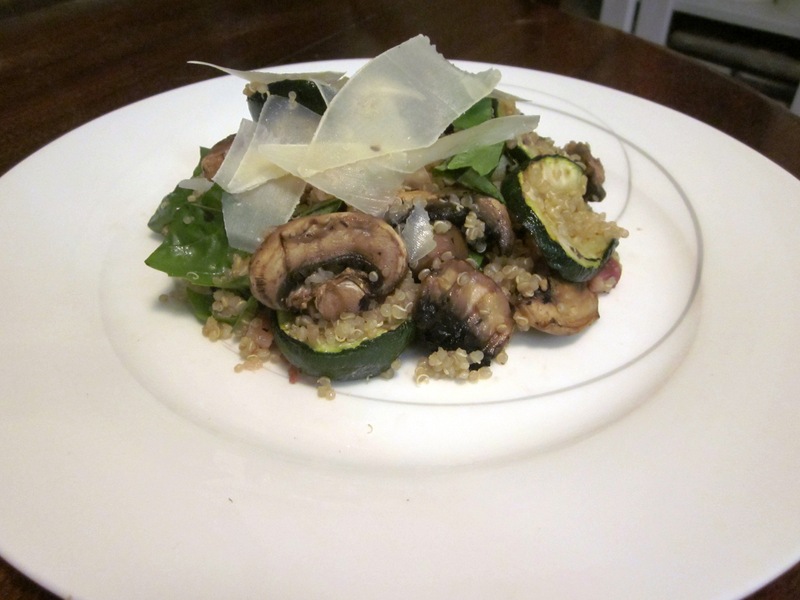 Although the method of cooking is quite different, the end result is reminiscent of a risotto, although the nutty quinoa adds a completely different flavour. As usual, I changed the recipe quite a bit. My friend doesn’t like parmesan so we used goat’s cheese instead. I love mushrooms so I doubled the amount of mushrooms as well as adding in baby spinach for some more green. We also found we needed to add more liquid so we added some chicken stock as well. The end result was surprising, satisfying and delicious. It was also great the next day for lunch. 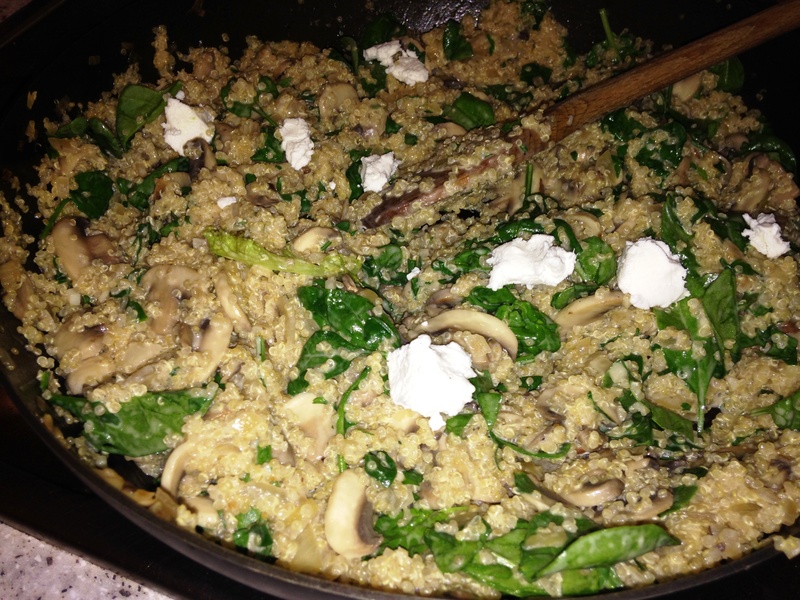 The creamy goat’s cheese went really well with the nutty quinoa. I will definitely be making it again. I have a confession to make. 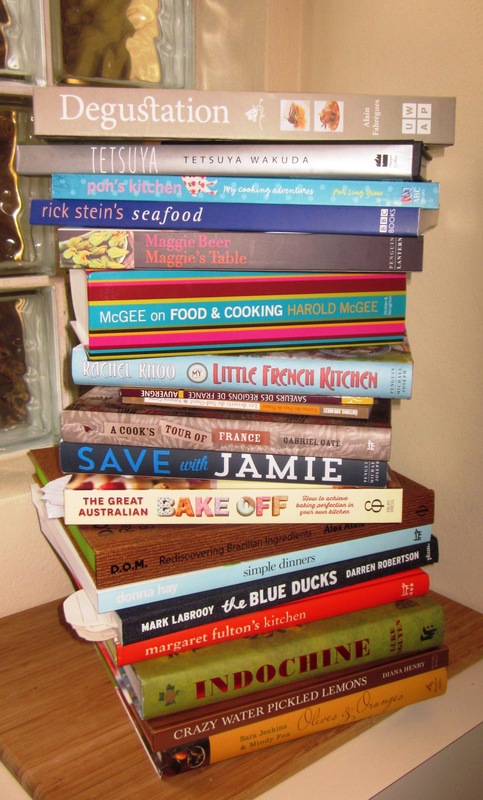 In April this year I set myself the challenge of not buying a new cookbook until I had cooked a recipe from five of my current cookbooks. It was going quite well for a few months and I also discovered the huge cookbook collection at the library next to my work, so I could borrow and look through as many cookbooks as I wanted, without buying them. Then a couple of things happened. First, I went to France in June, and told myself a couple of very small regional cookbooks in French didn’t count as they were “souvenirs”. But that was only the beginning. Then I went to the Perth Good Food and Wine Show in July, and I just couldn’t resist the chance to meet the cooks/chefs there and get a book personally signed (I owned some that I could get signed, but there were a few I didn’t have). Plus there were a few books on sale at the show (I mean, $10.00 instead of $50.00! What would you do?). 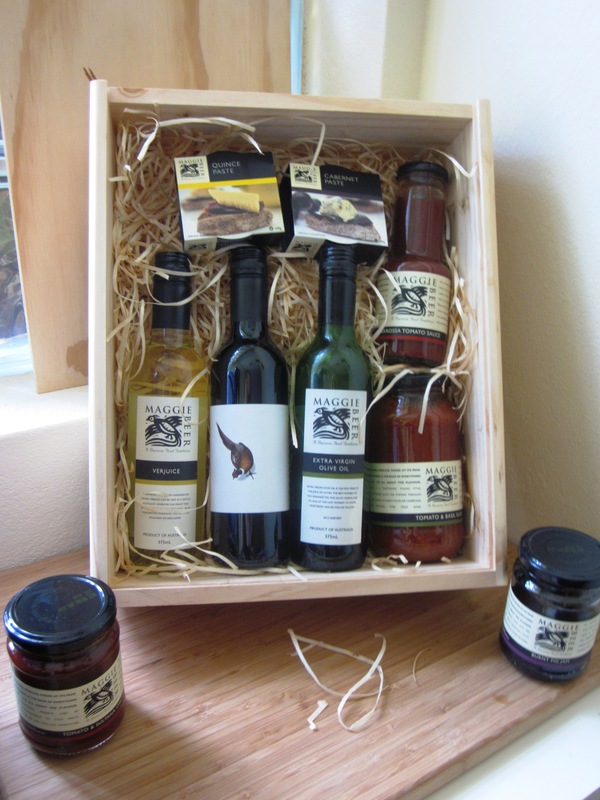 And you never know what might happen, a few words with Maggie Beer about music/singing while she was signing my book (thanks Mum) and the next thing you know, she is calling up “Sarah who sings” to cook with her on-stage an hour later, and sending me home with a big box of her products! I bought a few books over the next few months (always on sale), and then came the Margaret River Gourmet Escape a couple of weeks ago, where there was the opportunity to meet more incredibly inspiring and creative chefs, including Heston Blumenthal (who’s book I actually won in a competition a few months back, or I would have been buying one of his books too – you should have seen how excited I was when I found out I’d won a cookbook! Then actually getting it signed by Heston!!!). So I have to admit that I failed my challenge completely. But I do now have another eleven signed cookbooks in my collection, more inspiration and hundreds of new recipes to try, as well as the memories of meeting these amazing Australian and international cooks and chefs that inspire me. But moving on, it is time to try again. I think I have bought enough cookbooks to last me quite a while, so let’s see if I can cook through five of them before I even think about buying another cookbook. I can do this. After all, it’s almost Christmas and it doesn’t count if it’s a present…right? So back to cooking. This is the recipe that convinced me to buy The Blue Ducks cookbook. By 5pm on the Saturday at the Gourmet Escape, I was starting to fade after a day in the sun, but looking through this book again (which was the last book signing of the day), I gave in and bought it. This recipe for Mushrooms and Pearl Barley with Macadamia Bread Sauce just jumped out at me and I had to try it. I have since found the recipe is on the SBS website here. 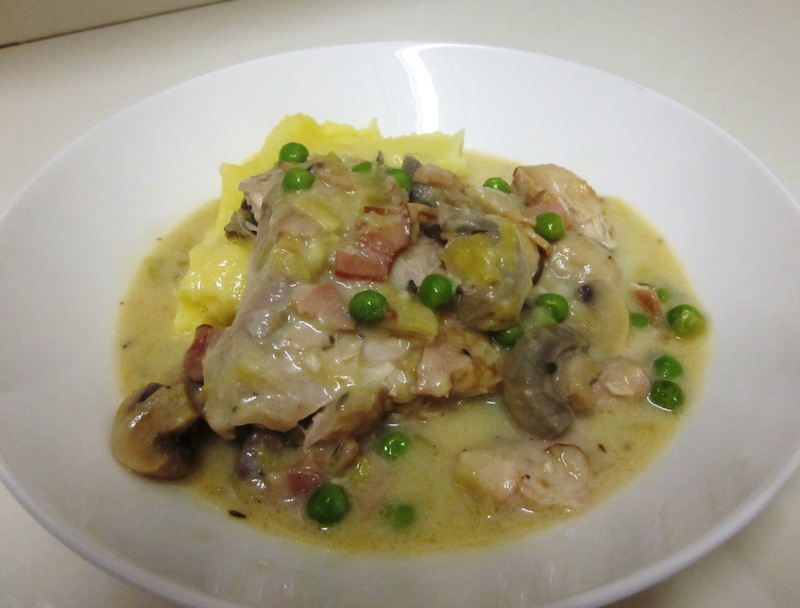 But having discovered other recipes in the book I also want to try, I have no regrets. I’m not sure about the bread sauce, I found it a bit too heavy and if I was to make it again, I would thin it down even more. But I liked using pearl barley instead of rice or couscous for a change, it was very filling and had a nice nutty flavour. I think I’ll try using it more in salads for work lunches. 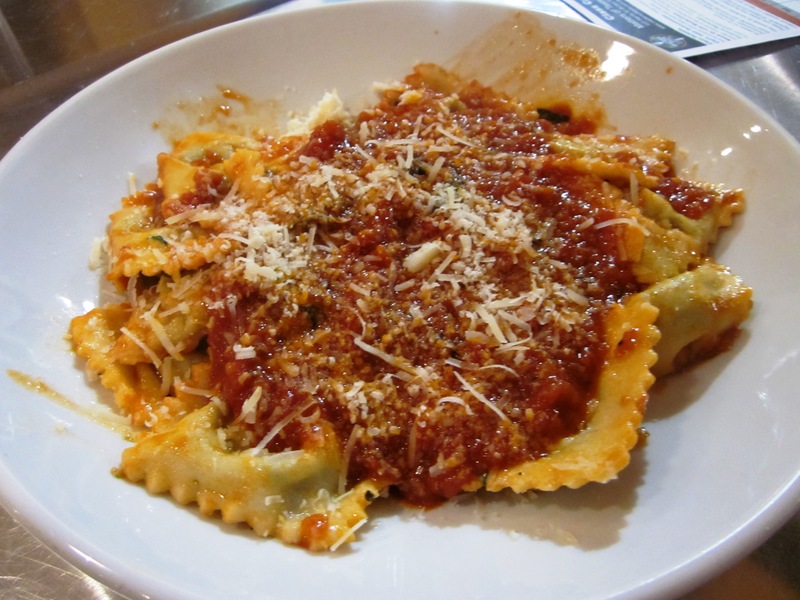 I like filled pastas such as ravioli, tortellini and angolotti but I don’t like buying the pre-made versions of these as I have no control over what has gone into the filling, and I often find they are too salty for me. 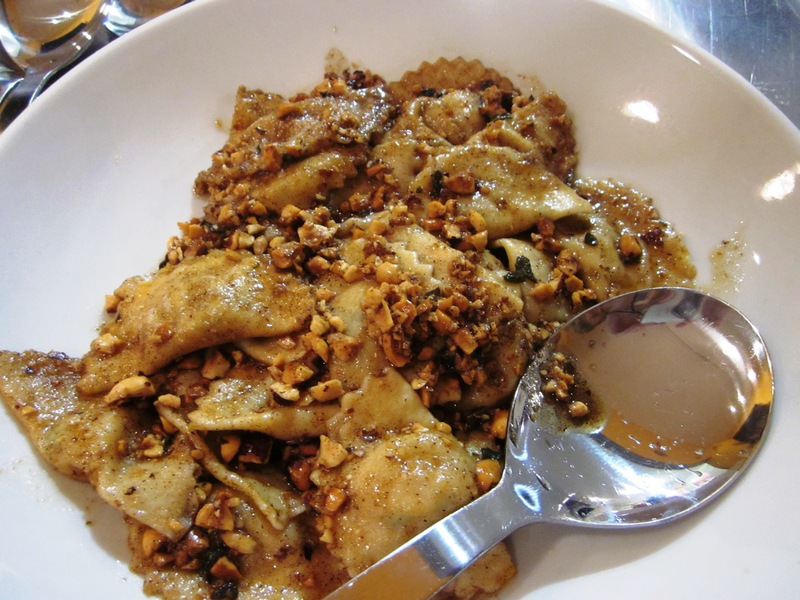 So I was really looking to going a class at Matters of Taste to learn how to make these types of pastas. This was another technical class where we learnt how to make the pasta and the three different filled shapes, and we each got try making each of these shapes. I was a bit nervous about trying the tortellini but found it easier than expected. As a group, we also made three different fillings and sauces (with each group of three responsible for one sauce and filling). I had a lot of fun and left filled with confidence about trying these at home. Spinach and ricotta ravioli from the class. 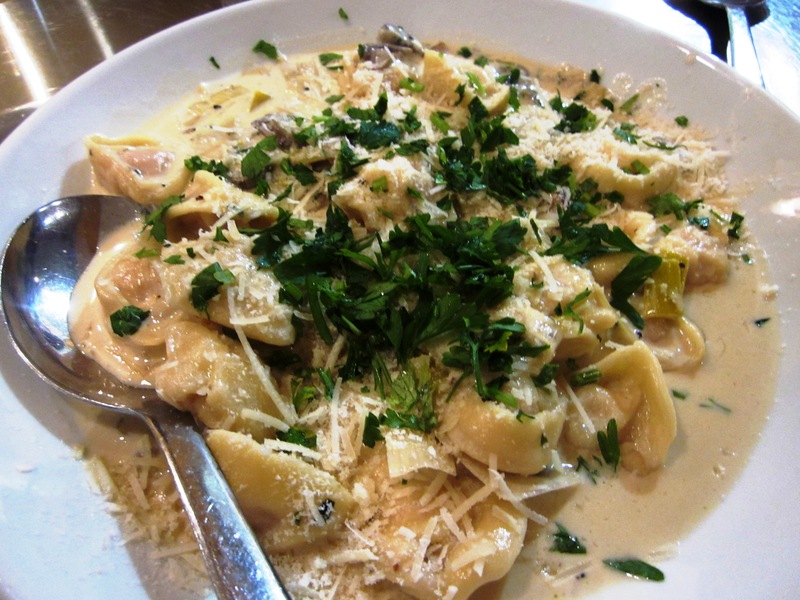 The next night, I decided to make the mushroom and goat’s cheese tortellini that I had recently seen on Masterchef – The Professionals. I used the pasta recipe that I learnt at Matters of Taste rather than the one from the Masterchef recipe, as I am now familiar with that recipe. However, as that isn’t my recipe to share (having received it at a class) I have included the Masterchef recipe for pasta below (the only real difference was my recipe used three whole eggs only and slightly more flour). Making pasta at home by yourself is quite time consuming and is definitely not for every night. I found this filling a bit difficult to use as it didn’t hold together well, but that may be because I added the goat’s cheese at the end as I’d seen on TV rather than mixing it through as the recipe stated. 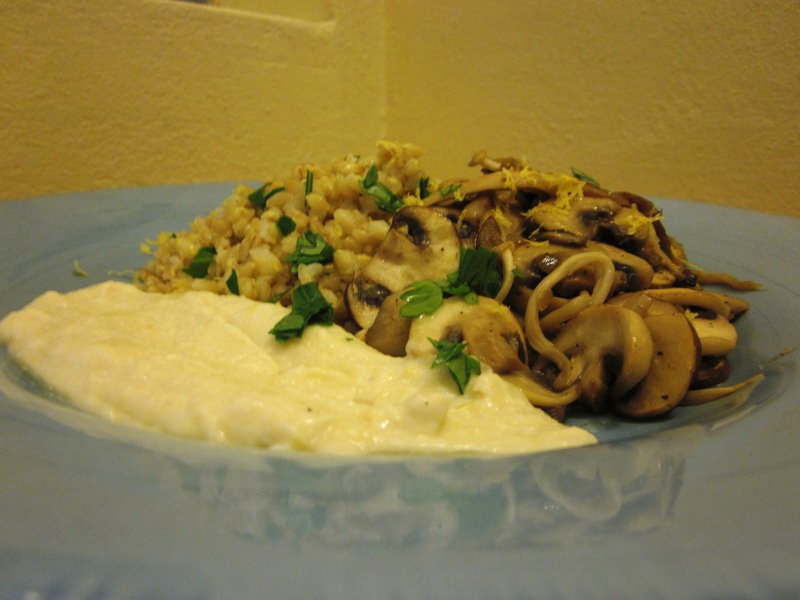 I was still happy with the results and loved the creamy goat’s cheese with the earthy mushrooms and silky soft pasta. I’m not a huge fan of the brown butter sauce however, so next time I think I’ll try a different sauce. Chicken prosciutto tortellini from the class, my favourite of the three we made. After my fairly unsuccessful attempt at Jamie Oliver’s 15 minute mushroom soup, I still had some mushrooms, parsley and thyme left over in my fridge. And a desire to make something that I actually wanted to eat once it was cooked. I also had some leftover bacon as well that needed to be used up. Not wanting to waste these ingredients I set about finding something I could cook with them. Episode 4 was based around the theme of mushrooms and Gill Meller matched the mushrooms with pastry and pancetta to make a simple mushroom tart, with thyme and parsley used as well. I always have some puff pastry in the freezer, and pancetta can be easily replaced with bacon. Perfect, a recipe for lunch to use up my leftover ingredients was found and after picking up a few more mushrooms (I bought a tray of different gourmet mushrooms to go with the swiss brown/button mushrooms I already had) I was ready to cook. The recipe, although taking longer to cook than the 15 minute meal mushroom soup, needed a lot less of my time and energy to make. A few minutes chopping and frying and then it was all in the oven. Easy. Which was just as well as I was starting to get a migraine. The end result tasted great (although I couldn’t eat it until later in the day once my migraine was gone), and I felt redeemed after the mushroom soup disaster. I didn’t feel like eating much that night after my migraine, so it was a perfect light dinner, while Jerome had it earlier in the day as his lunch.